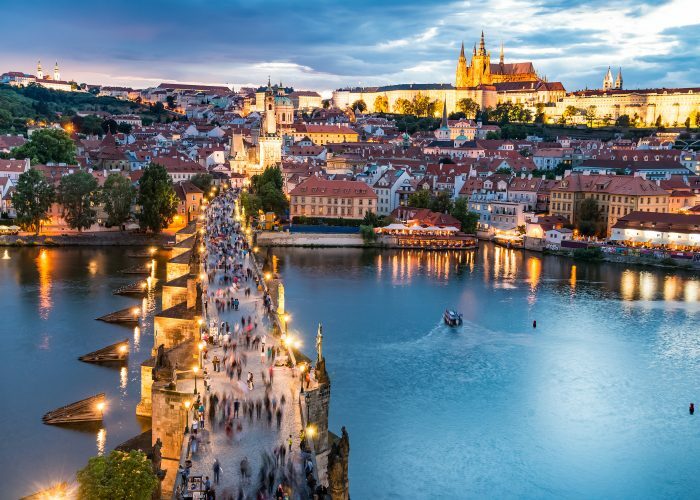 Visitors to Prague are likely to get caught up in the majesty of the City of 100 Spires. Gothic, Baroque, Renaissance, Romanesque, Art Nouveau, and Neo-classical buildings line the cobblestone streets that wind through the city's distinct neighborhoods. The Castle District claims one of the most popular sights, Prague Castle, which has three courtyards. St. Vitus' Cathedral is also located here, and guests can marvel at the Gothic gargoyles or pay tribute to "good" King Wenceslas. The Lesser Quarter's Petrin Hill offers panoramic views of the city of Prague, and the pedestrian Charles Bridge connects this district to Old Town. The Old Town area is home to the cubist House of the Black Madonna, which now holds the Museum of Czech Cubism. 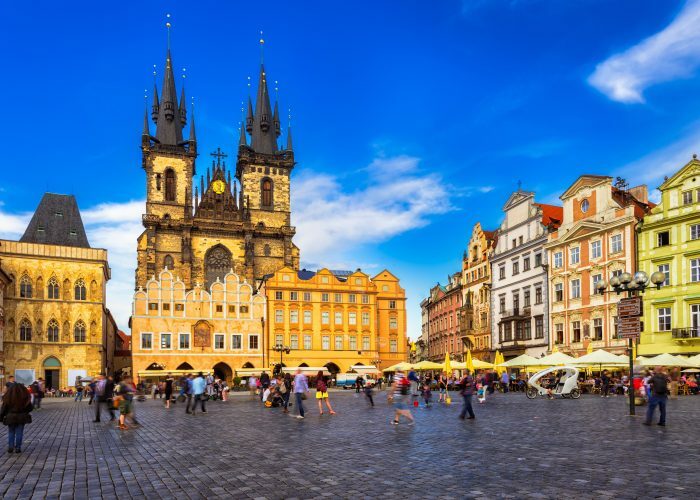 And Old Town Square, the heart of Prague, is surrounded by historic buildings like St. Nicholas Church and the 15th century astronomical clock. The center of modern Prague tourism is located around New Town's Wenceslas Square. Here visitors will find shops, restaurants, and cafes to enjoy. This neighborhood was planned in 1348, and there are plenty of Gothic churches to explore. More history can be found in the Jewish Quarter, where the Old-New Synagogue is located. Legend has it that a rabbi created the Prague Golem in the 16th century to protect the Jewish people, and that the golem still sleeps in the synagogue. Flights to Prague land at Prague Airport, about 15 miles from the city center. The airport is easily accessible by metro lines A and B.
Prague can be an ideal vacation destination almost anytime of year. The most popular time to visit is in the summer, when the weather is warm, albeit a little damp, and many musical events take place. The least popular time to go is during the much colder winter, except for the Christmas season when many holiday-goers enjoy the snow-covered city and festive events. Spring and fall are pleasant times to visit as there are fewer crowds and the weather is decent. Prague experiences a temperate climate. Summers are the warmest months, with average high temperatures in the 70s, but this time also receives the most rainfall. Spring and fall are cooler, with varying average high temperatures between the 40s and 60s. The coldest months are December through February, when average high temperatures can drop into the 30s. Prague's annual events attract large crowds, especially in summer, including the Royal Silvering of Kutna Hora in June, Rock for People from April through June, and the Summer Shakespeare Festival from June through September. Most hotels, shops, and attractions remain open throughout the year. The most expensive time to visit is during the high season. The best time to save money is during the low season months. Tips on Prague Warnings or Dangers – Stay Safe!